Please continue to support this worthy initiative through contributing and putting your offerings in the basket at the back of Christ the King. If we could supply especially UHT milk, rice pudding, custard, tinned fruit, pasta sauce. High Protein food such as tinned meat, tuna etc are also much appreciated. The Food Bank is desperate for food - especially those listed above - please help. Following the success of last year’s event The Friends of the Sacred Heart Parish are holding a Fashion Parade at 7-30pm in St Margaret Mary Community Centre, on Wednesday the 27th September, tickets £5 available from Alison Hather and Liz Sproat. Some dates for the diary for the Autumn. The annual diocesan pilgrimage to the shrine of Our Lady of Lourdes at Cleator will take place on Sunday 10th September with Mass at the Grotto at 3.00 pm. It would be good for the parish to attend, particularly young families. We will provide a bus to enable attendance of as many people as possible. Please consider coming along - sign up sheets are at the back of both churches. To enable us to integrate and support our new colleagues into their communities we are looking for ‘buddy’s’ who could help us with this process and be a friendly figure from the community to our new staff. Although Cumbria is renowned for its friendly population, some staff who already relocated have struggled to make friends, and can find it quite an isolating experience. We have evidence that if we can socially integrate people into their local communities they are much more likely to remain in the county, and this is an important aspect if we are to retain our much needed key healthcare workers. • Be willing to meet up with the new person or swap phone numbers / social media. • Introduce the individual to the rest of the church community. • Advice on church services including Family Mass if appropriate, bible study times etc. • Make them aware of church or local community social activities. They are particularly looking for Catholics as many working in the NHS in Cumbria are Catholics. “ Dear Parishioners, I wanted to thank you all for your financial support and prayers which enabled me to have a fantastic experience in Lourdes. It was wonderful to be able to support the less able members of our diocese to fully engage in the annual pilgrimage. It was really satisfying to be able to work with young people from other parishes and learn more about Our Lady, and our universal Catholic Church. In 2017 the SVP celebrates 400th anniversary of the beginning of St Vincent de Paul’s ministry with the most disadvantaged people, which inspired the foundation of our Society. The Carlisle District of the SVP will celebrate a Mass of thanksgiving at St Augustine’s, Saturday 9 September, 10.00am. Afterwards there will be light refreshments in the social room. Parishioners are welcome to this occasion. · Experienced primary or secondary teachers considering moving into senior leadership positions. · Deputy / assistant headteachers looking to move onto headship. Thursday 9 November, 9.30am – 3.30pm, Castle Green Hotel, Kendal LA9 6RG. Cost £52. Contact the Diocesan Education Service office on 01524841190 for more information and to book a place. Please return your Mission Boxes so that they can be counted. Many thanks. 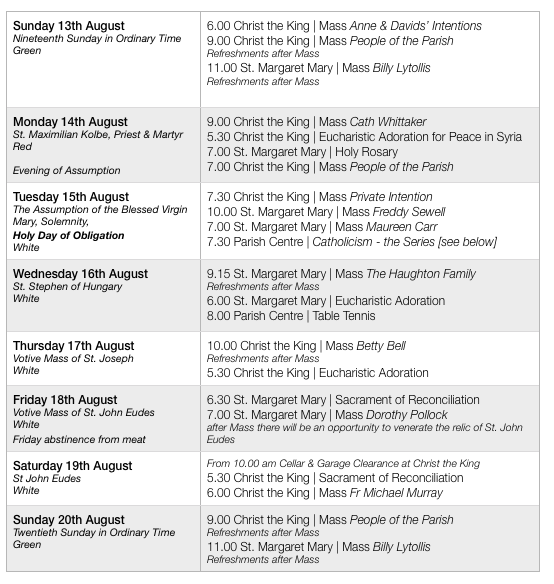 Tuesday 15th August is a Holy Day of Obligation - the Assumption of the Blessed Virgin Mary. The last Holy Day was very poorly attended in the parish. We are reminded that we are obliged, as Catholics, to attend Mass on a Holy Day of obligation. 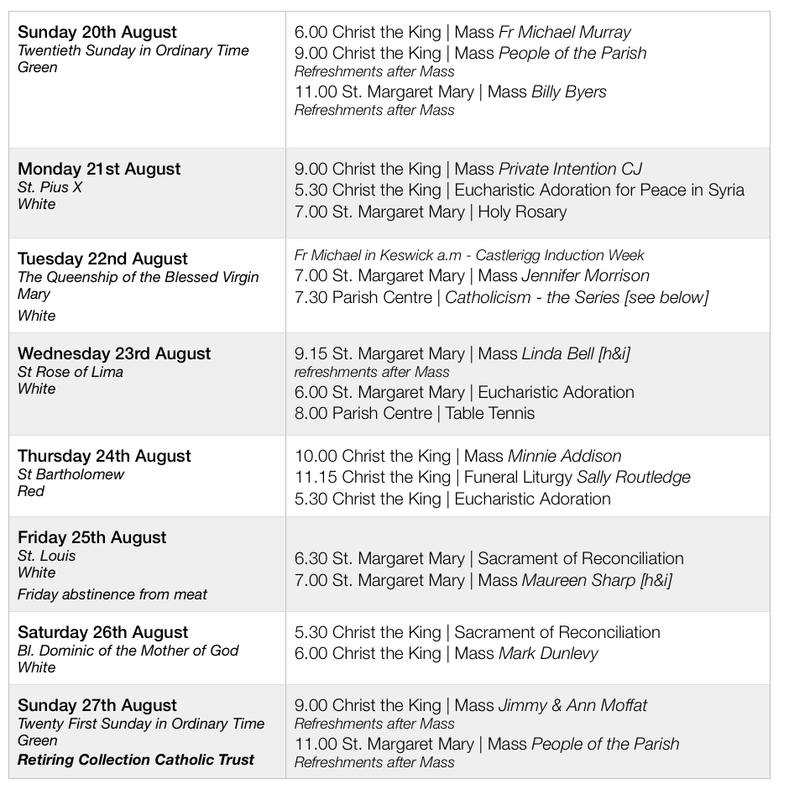 Fr Michael will celebrate a Vigil Mass at 7.00 pm at Christ the King on Monday 14th August. 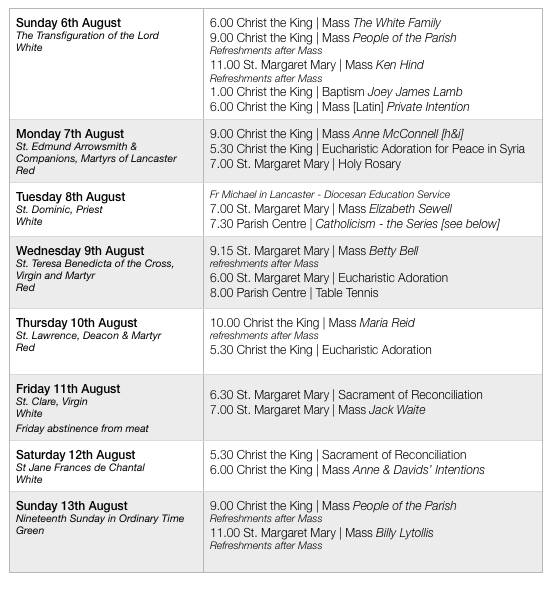 On the 15th August - Mass at 7.30 am at Christ the King [for those who go to work], a Mass at 10.00 am at St. Margaret Mary and a Mass at 7.00 pm at St. Margaret Mary…4 opportunities to attend Mass for this Holy Day! The garages and cellar at Christ the King are in need of a decluttering. If you are willing to help out, please come along on Saturday morning from 10.00 am. There’ll be bacon butties for lunch for the willing volunteers. 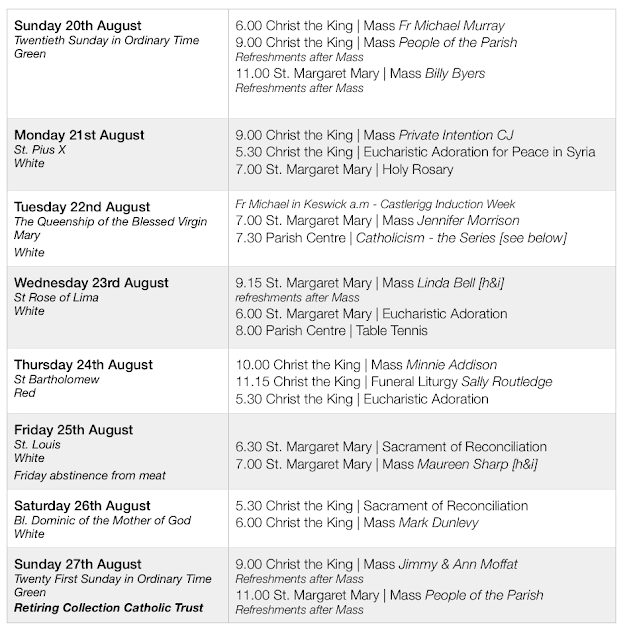 Numbers at Mass were Saturday evening -109, Sunday 9.00 am - 47 and Sunday 11.00 am - 89. A total of 245. Thank you for the offering of £487.56 at Christ the King and £217 at St. Margaret Mary. The total being £704.56. The Cor et Lumen Christi community invite women to be refreshed in the Living Water and experience the renewing love of God. Donation only event. Saturday 9 September at St Cuthbert’s, The old Convent, Wigton CA7 9HU. See the poster in the foyer. To book or for more information, visit www.coretlumenchristi.org, phone 016973-45623 or 07516-075896, or email stcuthberts@coretlumenchristi.org. As usual the young people are invited to walk in pilgrimage from Honister across Haystacks into Ennerdale then on to Cleator. They will begin their journey at Castlerigg Manor on Friday 8th September. The event is a great opportunity to make new friends and to triumph over a physical challenge. The walk is about 10 miles each day and concludes with the diocesan Mass at Cleator at 3.00 pm. Age 16+ Young people can register their interest in joining the walk by contacting Fr John at Castlerigg - tel. 017687 72711. This weekend there will be a voluntary collection at Christ the King at all Masses to fund the weekly display of flowers in the church. Researchers at Coventry and Leicester universities are working with Christian charities Restored and Churches Together in Cumbria to carry out the first major UK study of Church responses to domestic abuse. The study will collect vital data that will inform the training provided to churches. We invite everyone – whatever your gender or experience of this issue - to take part in the research. The research has received ethical approval.